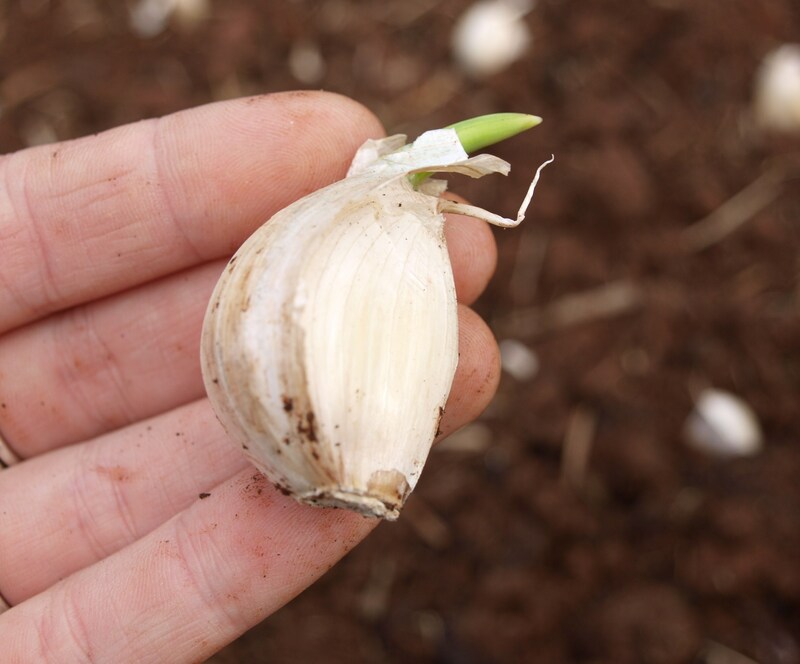 Last week the weather finally begin to feel right and I noticed a few of the garlic bulbs beginning to shoot – a sure sign it was time. This year I’ve decided 3 square metres of garlic maybe a bit too much. Instead I am planting out 1m for our use and 1m for selling or gifting. Sometimes I’m prone to over thinking things. Maybe I spend too much time with a toddler (who turns 2… 2! on Friday) or it is just my personality. But I had this crazy idea in my head that growing climbing beans wouldn’t work in my gardens. Not enough room, they need a frame, blah blah blah…. I have several types packets of seeds in my collection but I never sow them. I usually grow dwarf beans. Little plants, fast growing and produce a lot in a small space. However in the last 2 years a rusty fungal disease has attacked the plants. The last crops so bad I’ve had to pull them out. 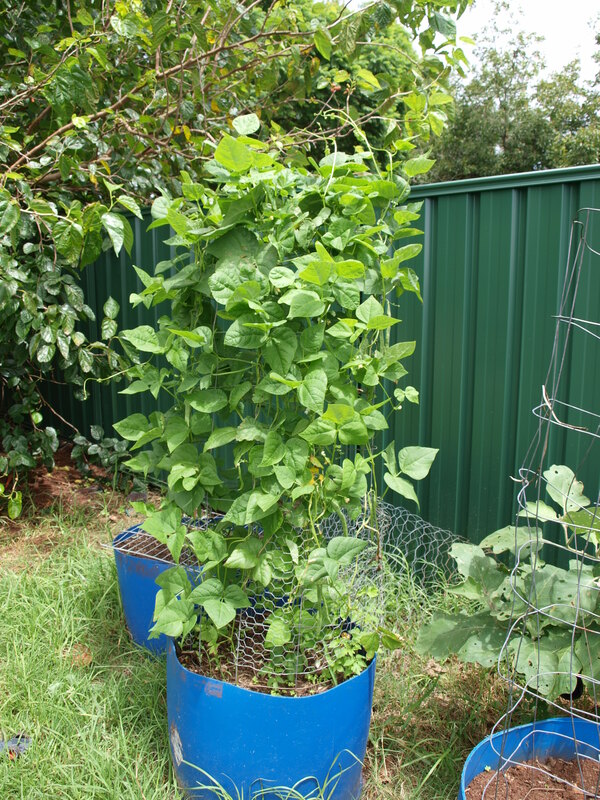 Desperate to keep the beans coming in (1 of only 3 vegetables Mr6 will eat) I dug through my seed packets and came across a packet of climbing beans. Why oh why have I never planted these before? In this 100L tub I have maybe 10 plants. And the beans are pouring in! So I’m left asking myself what was so hard about growing climbing beans? In earlier years its always a relief to turn the calendar over to March. March means autumn, a relief from the heat and a little less time watering the garden. This year has been different. Summer was wet and surprisingly cool. The garden has produced such a bounty this year, much more than I expected. Endless carrots, beans and just enough tomatoes to freeze a small supply of sauce for the next few months of the ‘between season famine’. Oh and see the basil there at the front? Most of it has gone to seed now but a few plants I will chop back to below the seeds. Then in a few weeks there will be another batch of basil to harvest and turn into pesto. Not that I haven’t already got a freezer full of green goodness. With the tomatoes looking tired and full of fruit fly, it was time to pull them out. 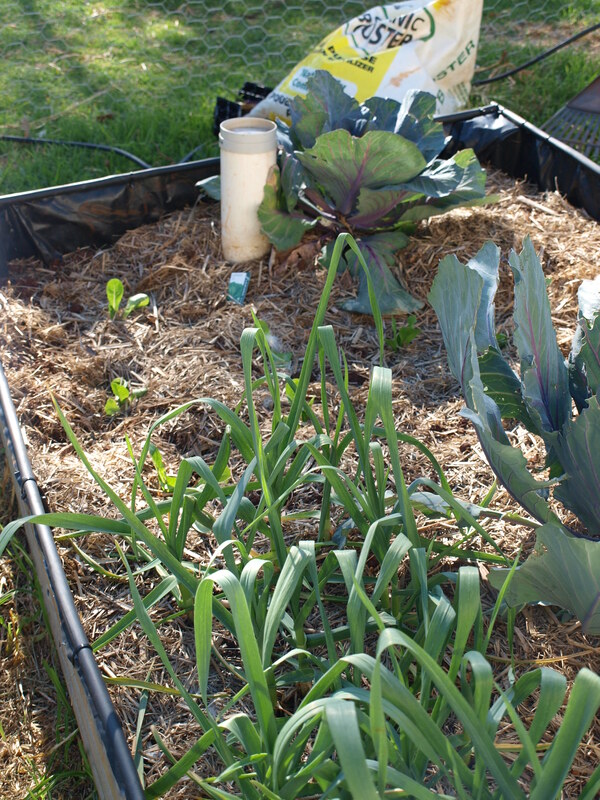 Compost went in and chicken-poo-infused mulch on top. The big gap in the garden will be filled later today with the first of this winters brocoli plants. I brought a punnet and will share half of them with the neighbour so 4 plants will go in. I figure that buying in the stock will put me 4 -6 weeks ahead than if I sowed my own. Meanwhile I still have 3 trays in the propagation box germinating (hopefully) as I type. Which will be ready for planting out in about 1 month. This will be a follow-up crop. I’m enjoying my current gardening style, when something goes out, something must go in. Be it a few lettuce seedlings from the nursery (ready to eat in just a few weeks) to climbing peas that replaced the carrots. I am trying to space out plantings, to avoid that glut as I’ve had in earlier years. Only putting in 1 tomato plant and when it starts flowering the next went in and so on. I do the same with dwarf beans. To date this has worked amazingly. A steady supply of food is flowing into my kitchen and our bellies! Slowly the season is changing and the soil warming. 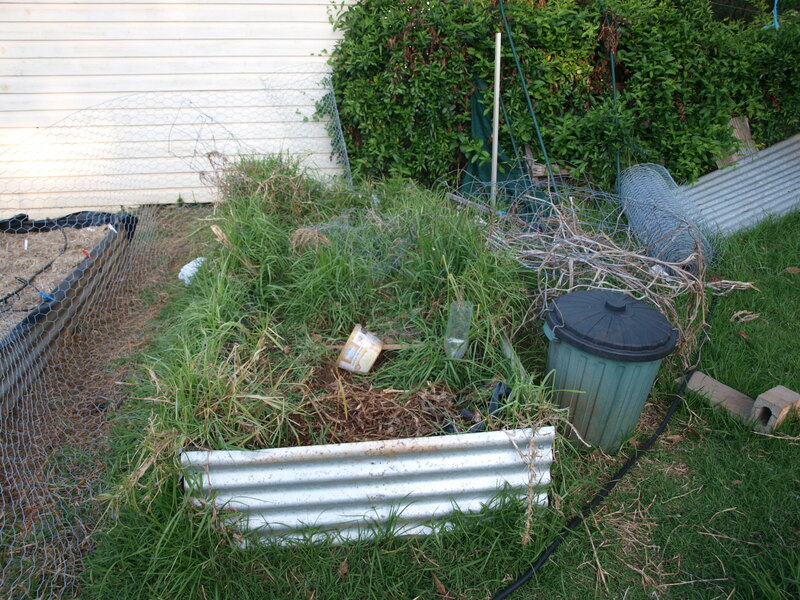 With that comes such a flurry of garden work – sowing, watering and weeding – oh the weeds. Do you want a quick peek of what’s happening? WELCOME to my garden. Excuse the fence, it will be repaired once I repair the last garden bed and paint the posts – I am thinking purple or maybe red? :: Purple Cabbage – a hanger-on from winter I am rather proud of my cabbages this year, they have good firm hearts! :: Basil- they maybe tiny now but I am hoping (with fingers crossed) that these 4 leaved seedings will soon become the source of a year of pesto. 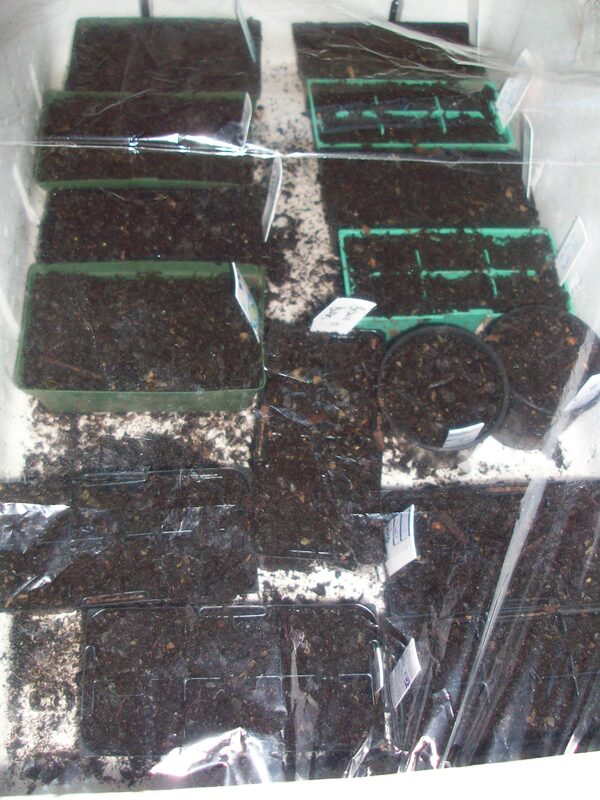 And yes there is more seeds propagating, to date and 1 square m planted out. Yes this is a vegetable garden full of Kikuya grass. Have I been avoiding it? Yes again. I don’t even know where to start. Spray the grass or dig it out? or maybe just simply ignore it…. Thanks for having a look around with me, I hope you too are having a great spring flurry of activity! 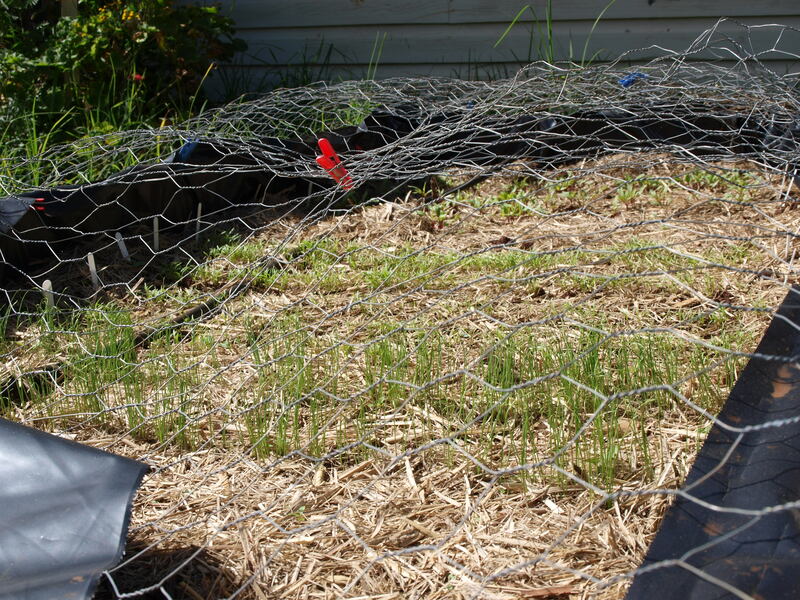 Bed One has erupted into life with beetroot, carrots and slightly to thickly planted spring onions. I’m thrilled with the germination rate in this bed. The beetroot I soaked the seeds overnight. See my fancy-held-together with pegs bed covers. 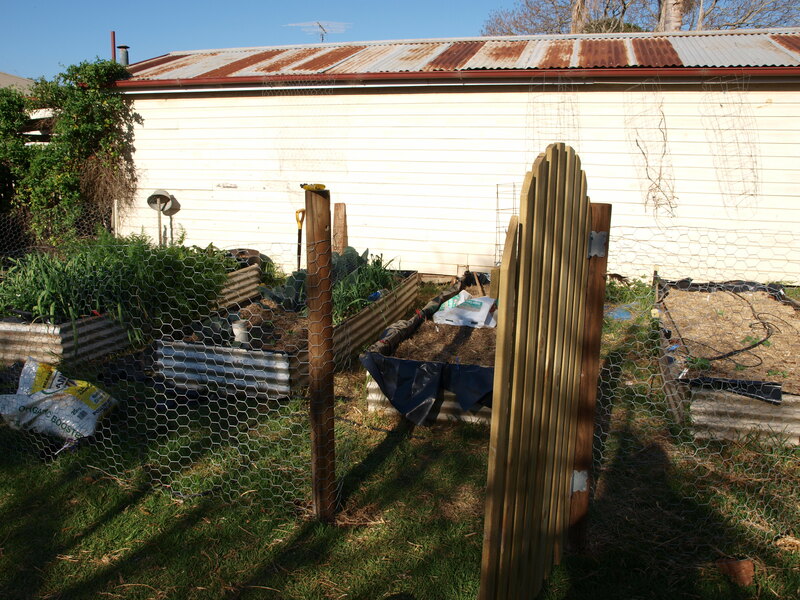 Daggy, but kitty and chook proof! For years I always assumed carrots seeds had to be mixed with sand to make sure they’re spread out. I had an ah-ha moment recently when I thought why sand? Why not dirt or compost? So this time I deposited a handful of seeds into a handful of rich black compost*. Into drills it went. 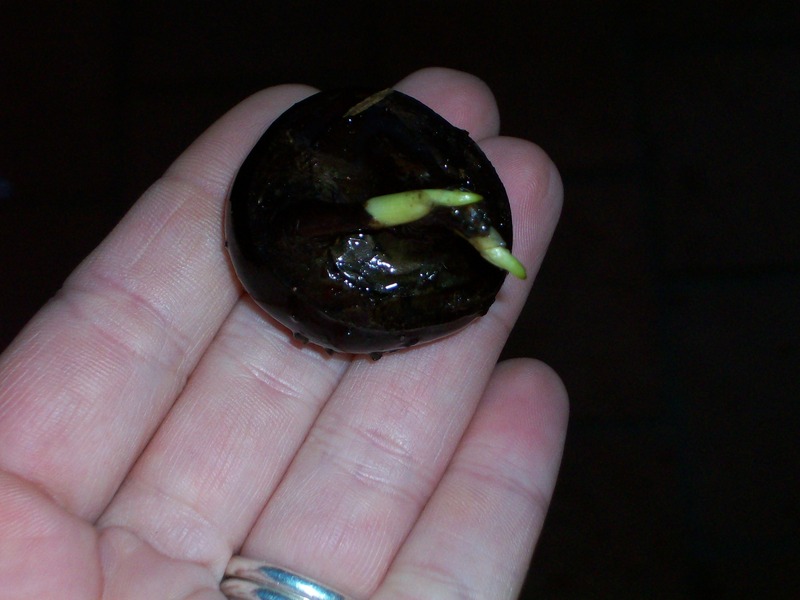 (I covered the seeds with a old cardboard beer carton) And 2 weeks later this is what it looks like! I know many others in our local area are possibly feeling the same as me. Defeated. I want to childishly whine about the drying winds, the lack of rain and wacky seasons. The seedling eating slug and the just bad luck I am having with the garden this year. But I refuse too. No this will be post showing the goodness that is growing and hopefully eaten in the future! Bed 5 has finally got some plants in it. 4 capsicums, 2 tomatoes and 2 eggplants so far. 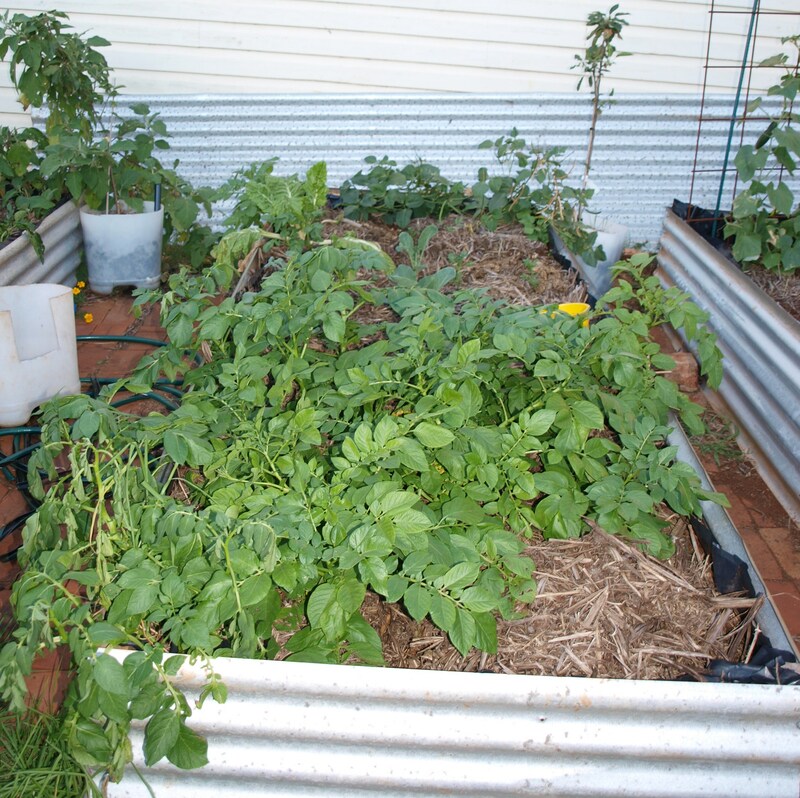 The plants are growing so well the tomatoes have tripled in size in the last two weeks! Today I noticed the first flower buds. 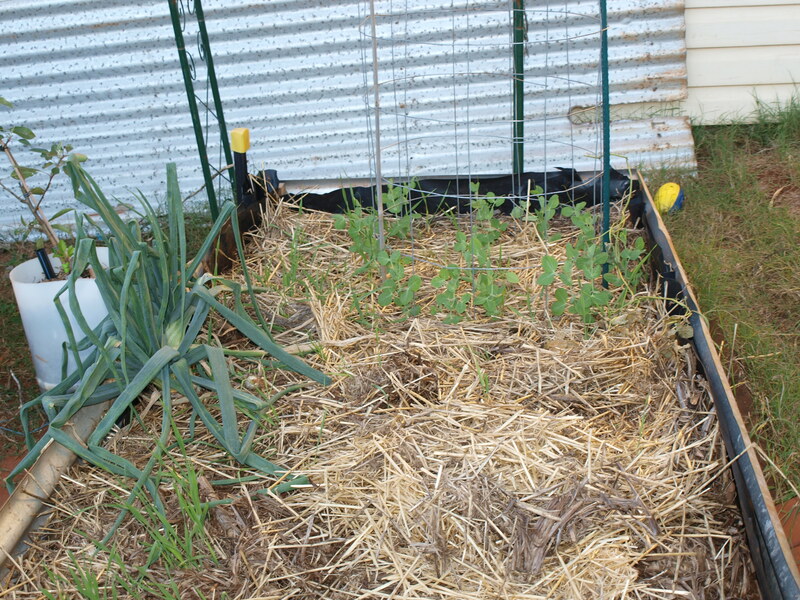 Meanwhile in bed 4 the pea plants are dying off and I am harvesting the dried peas. While the peas are winding down the beans are just starting. 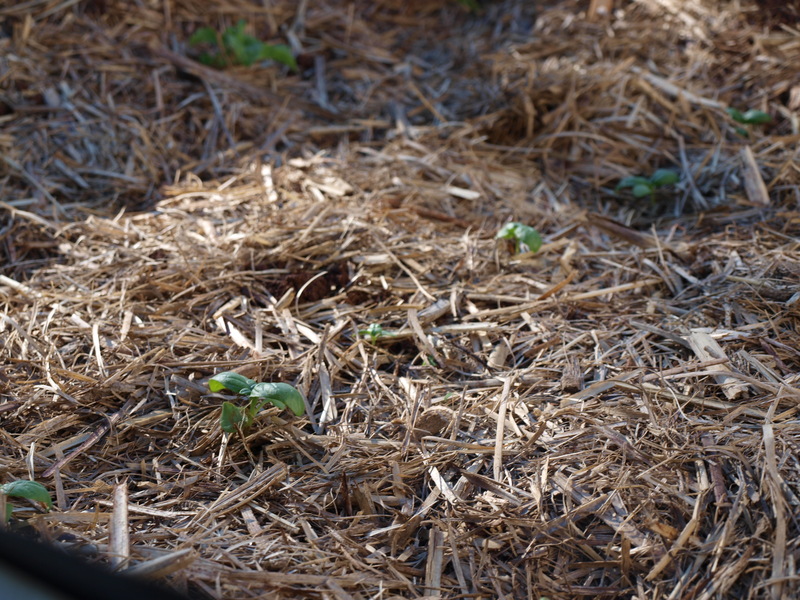 The first planting is growing fine and the second crop is just emerging from the soil. Meanwhile the shalots that I planted are up and growing well too. 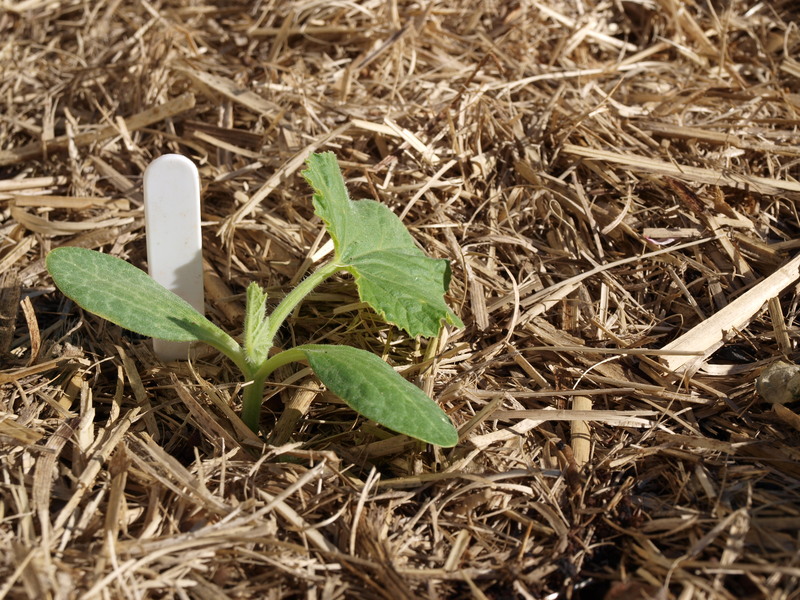 Also a handful of sunflower seedlings have been planted out, they are looking abit sad but hopefully they will perk up soon enough. My lettuces are looking good, I think I planted them too thickly, but I will prick them out in a few days when they are a bit bigger and share them with mums at school who also grow a few vegetables. 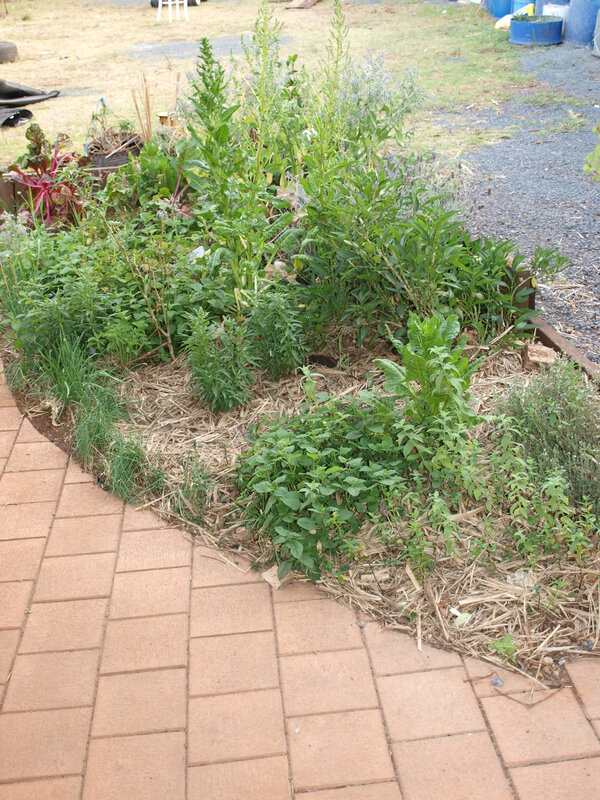 And finally the best piece of the garden – the herb garden. 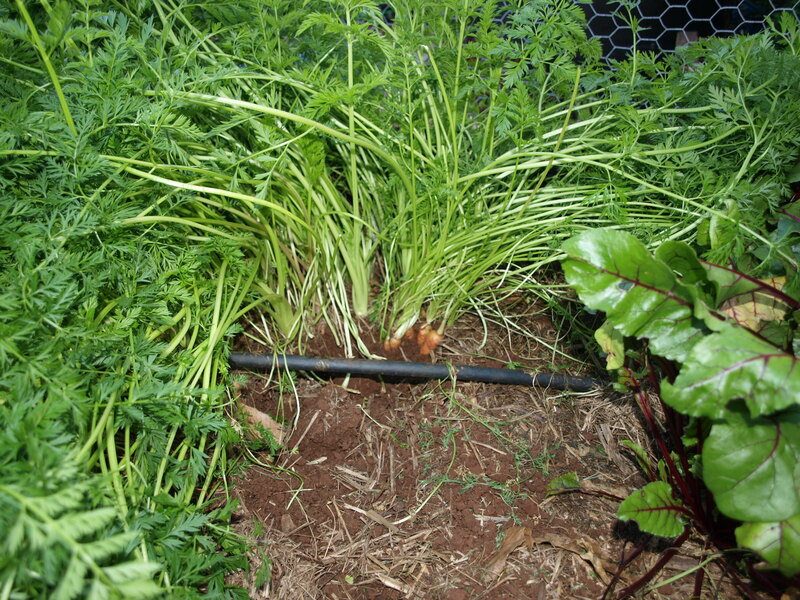 It is busting with goodness chives, parsley, mint, lemon balm, silverbeets, pepino, lemons and borage. I truly love this garden, I have only planted out some flowers the rest is all self seeded or perennials. Occasionally I pull out some borage as it is just taking over the garden, its popping up everywhere. 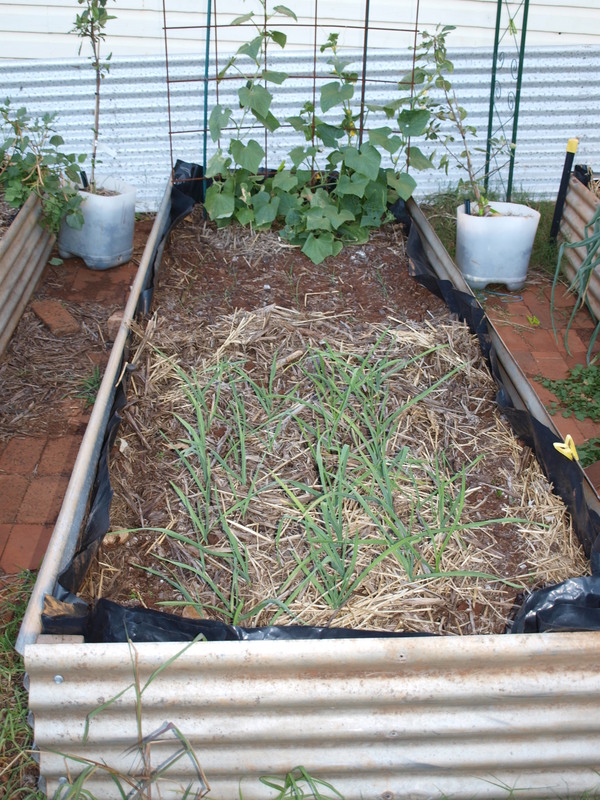 So despite the tough conditions summer is starting in my garden and soon I will be harvesting onions and garlic. Lovely! 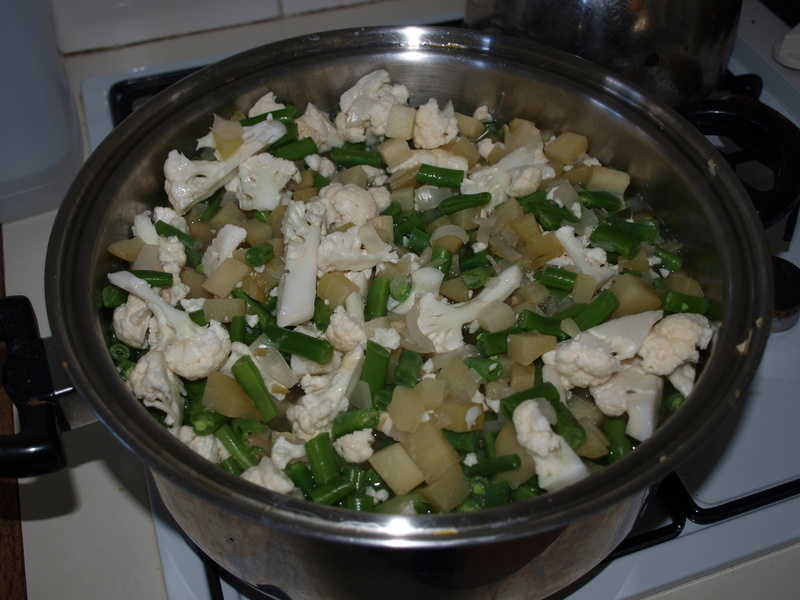 With the onset of the cooler months I have switched from growing the warmer season produce, to the cooler ones of onions, garlic, carrots, cauliflower and broccoli. Mentioning broccoli I have had awful luck with germinating the seeds this year. I must have a poor batch of seeds. I am on my third tray of seedlings and I have about a 20% success rate. Out of desperation I brought seedlings today! I have some new seeds on order so hopefully I will have better luck with them! 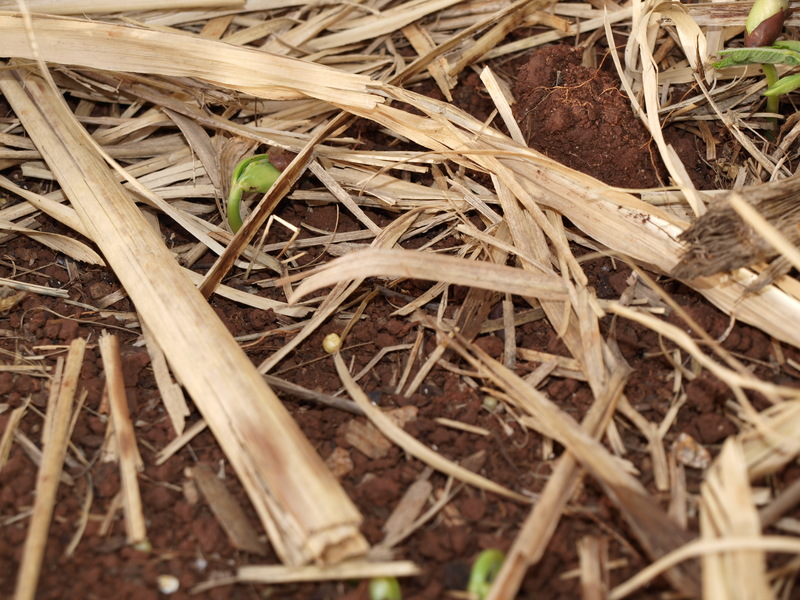 My beautiful crop of beans that I expected to produce until the frost hit, have succumbed to rust. It started as little rusty orange circles on the backs of the leaves and finally started to infect the pods. I should have treated it before it became so out of control, I do know better. *Sigh* Another lesson learned. I will be sure to plant rust resistant varieties next year. Dwarf beans with rust spores on the leaves. The refreshed bed after the beans were removed. There is still afew volunteer potatoes growing, I will let them go until the frosts knock them back. Fingers crossed there will be a few good ones to harvest. The cucumbers I planted out way back here are growing so well! 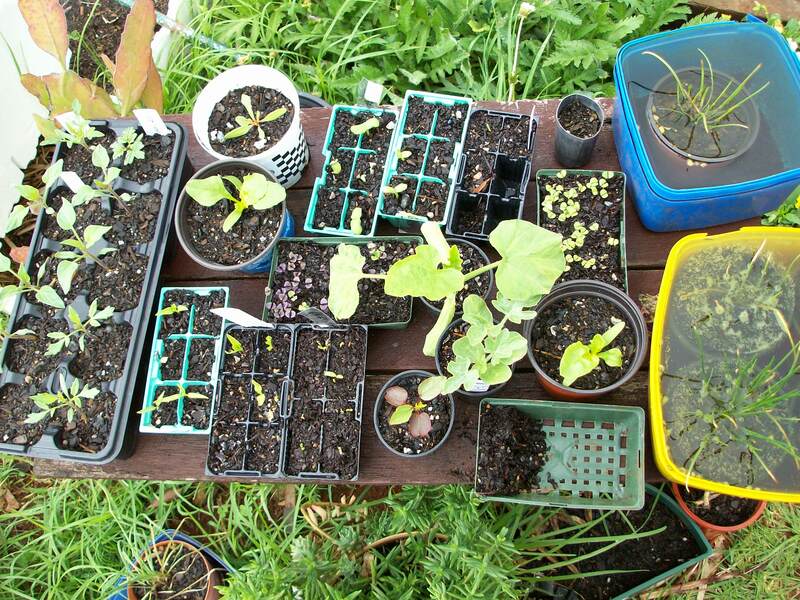 I must remember next year to plant out some seeds later in the summer. They seem to be enjoying the cooler weather. 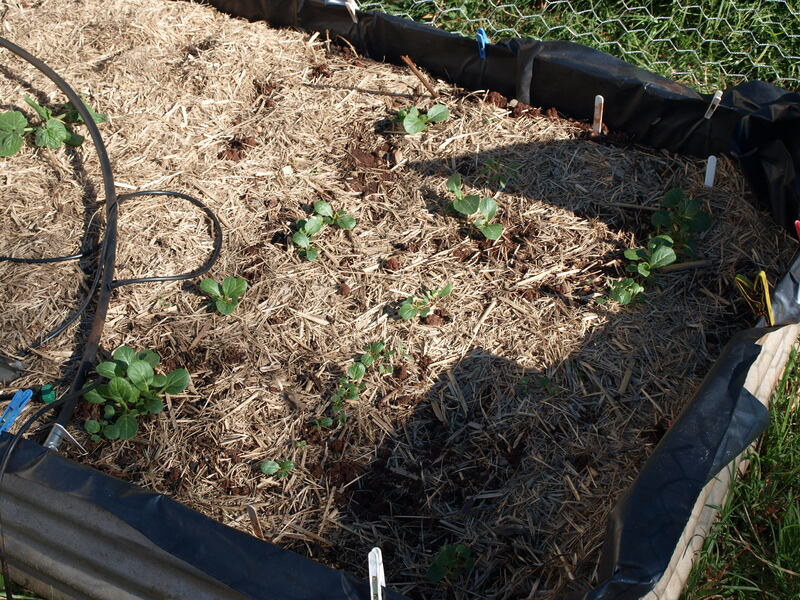 I am going to put a sheet over them during the frosts, just to see how long I can keep them going for…. 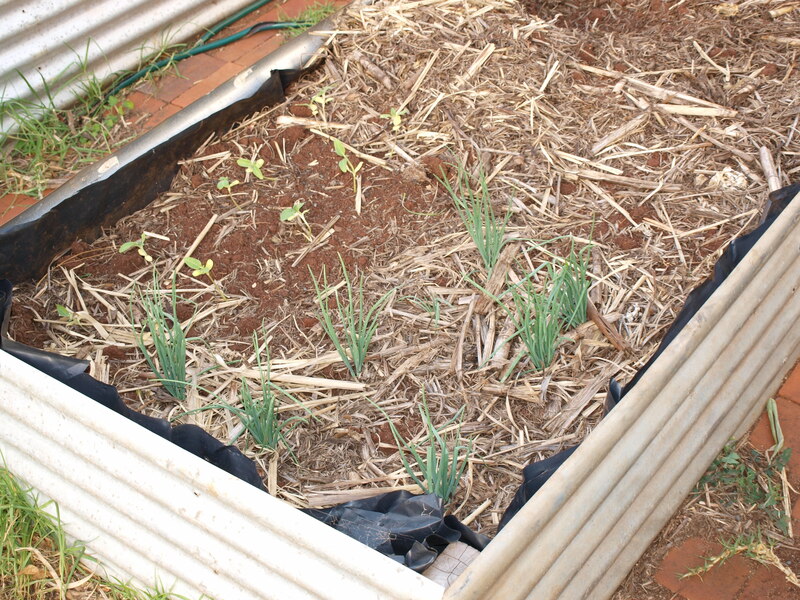 Also in this bed is garlic, onions and carrots. And finally the peas are growing merrily, I will pop the next lot in shortly so hopefully there will be a good supply for them soon. I am growing them on the tomato towers. Multi-purpose! I love it. 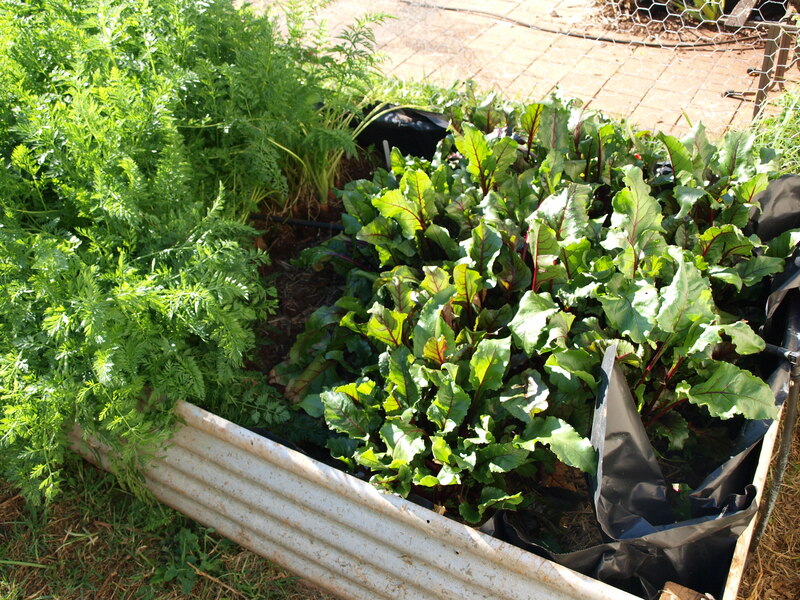 On the harvesting front, we would be starving if we depended on the garden soley for food at the moment. Learning things such as successive planting and just how far I can push plants in our climate are important. But these things will come with time and experience. 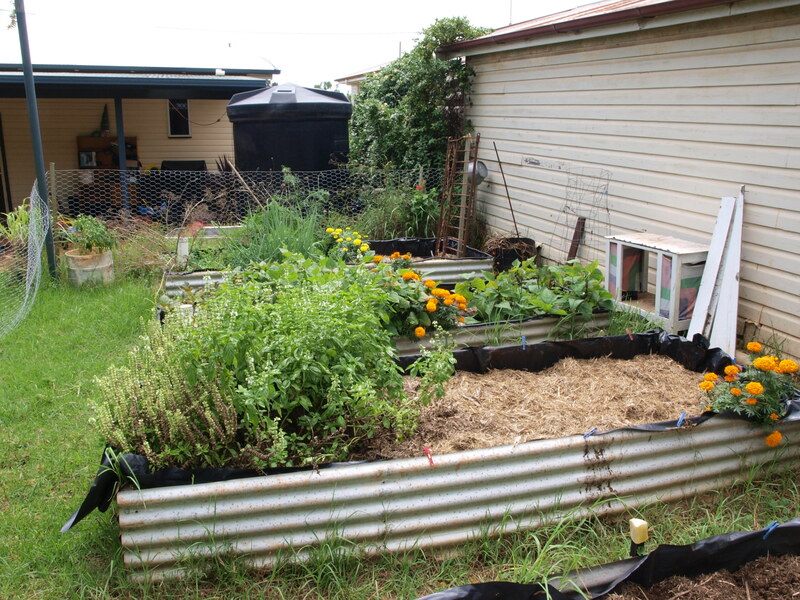 How are your gardens going? My nursery of seedlings are growing well. I have 2 kitty litter trays that I sit them in (not shown in picture). Each morning I fill the tray with a cm of water this is enough to keep them moist all day, but not enough to cause rotting. 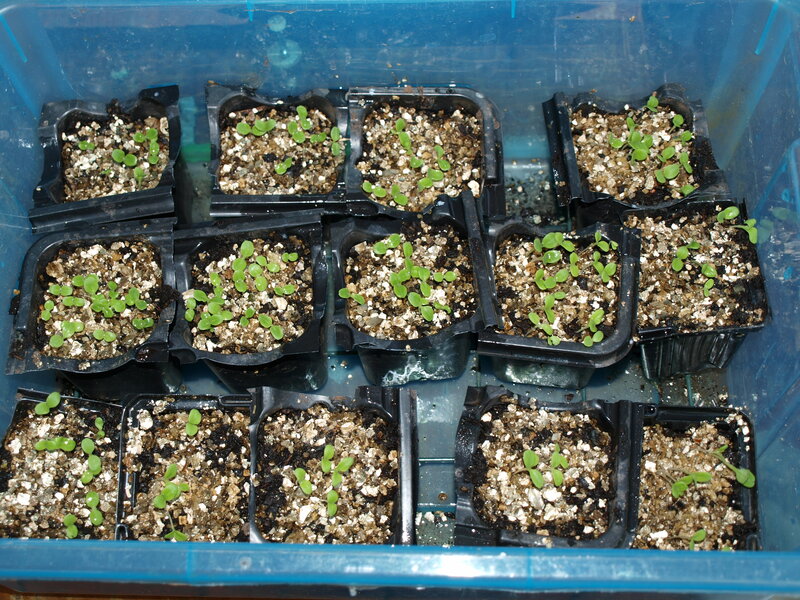 The tomatoes will be ready to plant out in a week and the basil is starting to form its first set of true leaves. I also have my water chestnuts here (they are the dishes full of water) Hopefully I will get them into their new home today. 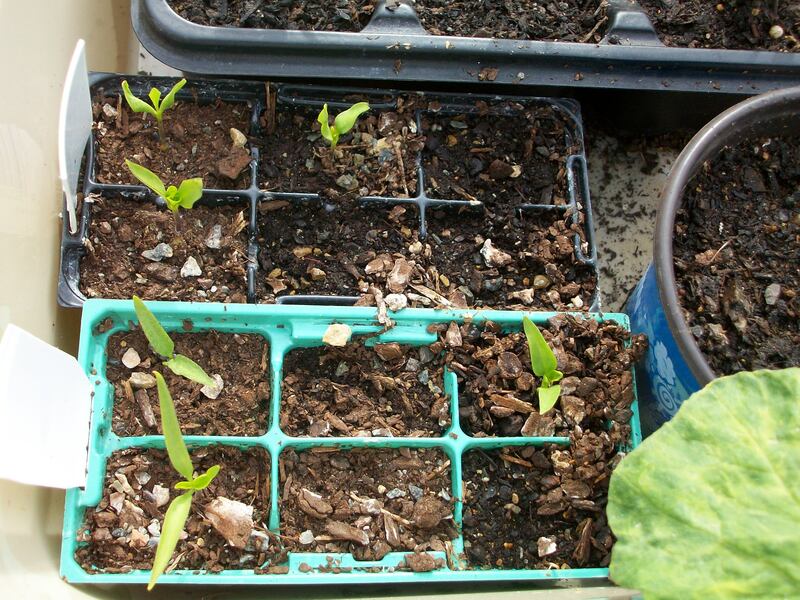 For my first spring sowing I used a styrofoam box to propargate my seeds. It worked ok, however I could not keep the moisture levels up & this lead to poor and irregular germination. On a recent shopping trip to the hardware shop I saw a propargation kit made out of a plastic storage box! They wanted $20 for it. 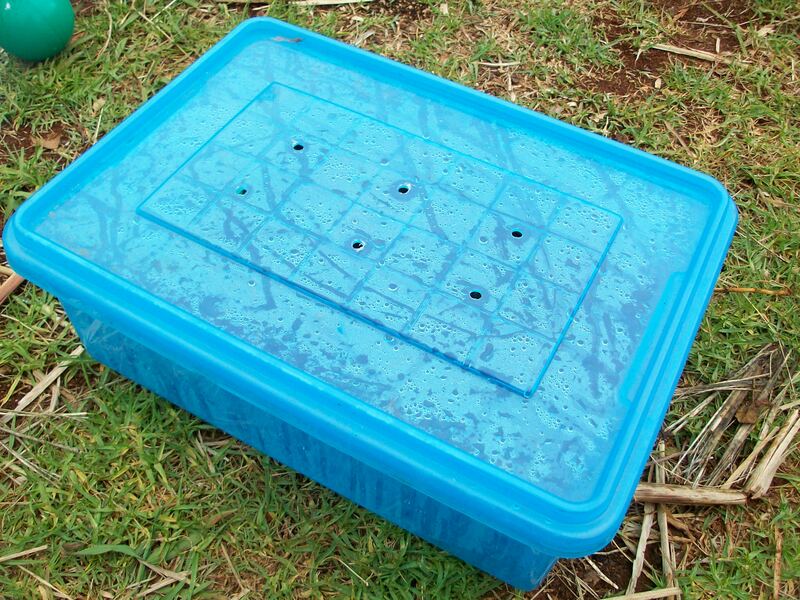 Once home I found a spare plastic box (the colour doesn’t seem to worry the seeds lol) drilled 6 holes in the top and there you have it a Propargation Box! I can fit 6 seedling trays in here. At the moment I have eggplants, chillis and silverbeet germinating. I keep the box in a warm place on the back verandah, out of the sun. Ocassionally the seeds need some extra water, but not very often. As soon as the seeds have germinated they are placed into the nursery section. 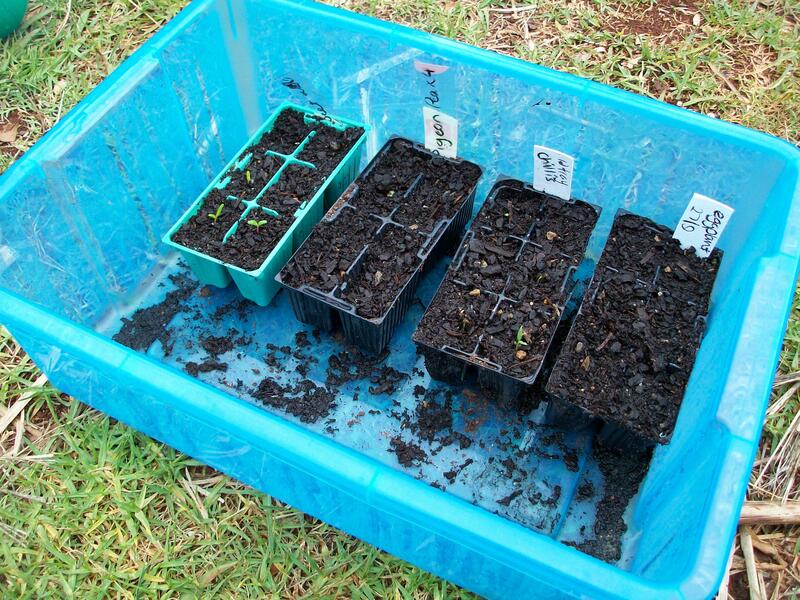 Before I use my seedling trays I soak them overnight in a water and bleach solution. This kills any soil bourne fungus or diseases. Use fresh propargation mix everytime. I prefer to use one that contains some fertilizer, when propargating vegetable seeds. This gives them the head start that they need immediately & often I do not have the time to prick them out and pot them up when the poor things need it. Avoid overhead watering of seeds once they have been sown. Wet the seed raising mix before the seeds are sown. 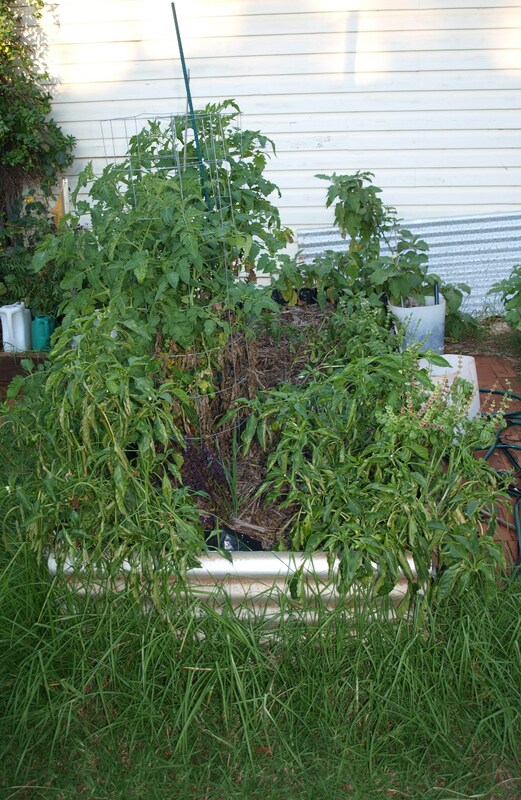 Do not let your seedlings get leggy, this leads to weak and disease prone plants. Get them out into the sun as soon as possible. However do not immediately place them out into the full sun. Shade them under another plant or put them out on an overcast day. 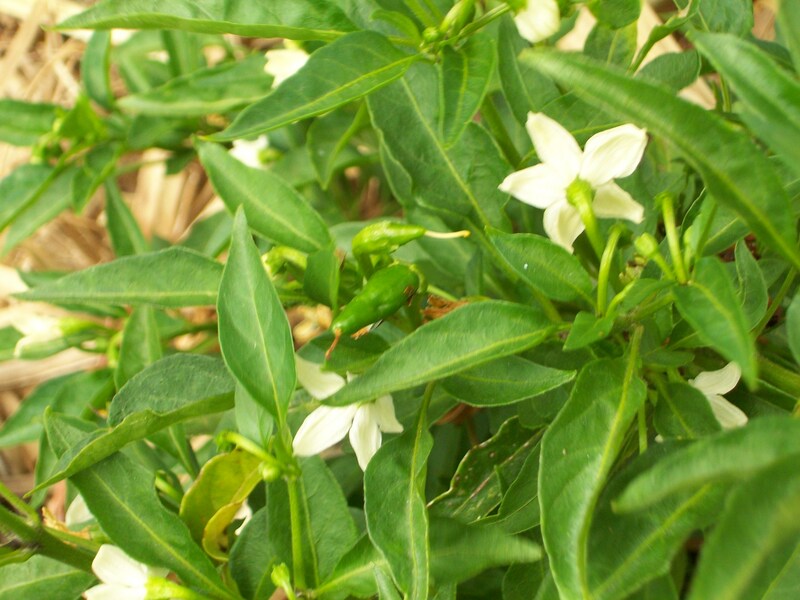 Tiny, tiny Chilli’s have finally started to form on the new chilli plants, much to Tony’s delight. So this is it for my ‘New’ at Little Farm Series. Monday I will have an update of the vegetable & herb gardens. Have a fantastic weekend and for all the racing fans enjoy the race at Bathurst this weekend. With the vegetable gardens being built soon & the moon right for green crops I have been sowing seeds like a crazy woman. I have planted so many seeds this week that I have run out of room in the propargater, so I have made one with a styrofoam box and an oven bag. 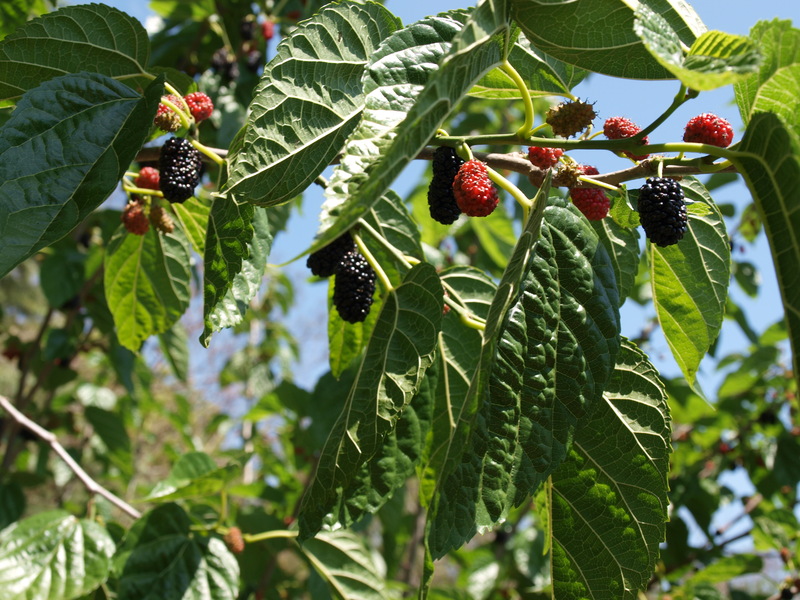 What are you planting for summer?